This isn't just any Pocky, it is flavoured RICH MILK. It tastes very similar to normal Milk Pocky except sweeter. This is now my favourite flavour! The very popular Happy Kitchen is here! We have 4 varieties at the moment including Hamburger, Cake Shop, Sushi and Donut Shop. If you follow You-tubers you have probably seen them make these. A DIY Candy Kit where you mix ingredients with water to create the theme of the box. A yummy Mango flavoured Gummy Candy shaped like Moons and Stars from Sailor Moon. As stated on the ingredient page they also have useful ingredients such as "shield lactobacillales" from yogurt and 2000 mg of collagen to help keep a "youthful appearance"
Strawberry Cream flavoured Oreo's. Only one word: "Yum"
Comes with the flavors of Dakara, C C Lemon, Natchan, Aserora, and Dekavita. If you have ever visited Japan, you have definitely seen these iconic drinks. 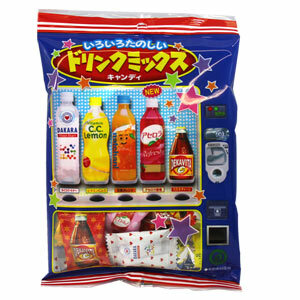 Comes in a bag designed to look like a vending machine. So funky! Chocolate surprise Egg with a mini Mario figurine, collect them all! Come in store and check out all of the other items we have! Another order is expected to arrive within the next week (YAY).